How to teach safety awareness to primary school pupils in a modern and interesting way? Janne Leinonen and his company Lucasoft suggest RescuePosse – a game that has been tested in an agile experiment this year. Business Tampere Magazine participated in a testing session in Kissanmaa Elementary School. Excited pupils pour out of a classroom: ”The game was really fun!” They’ve already tested RescuePosse, and class 3C is the next one to go. Six pupils will be playing at a time, others will watch and cheer. The testing sessions are led by the RescuePosse game developer Janne Leinonen. He works in the field of safety education at Tampere Region Rescue Department, has studied interactive technology and programming, and is a games enthusiast. The idea of developing his own game originated both from the rescue service needs and his programming ambitions. – I think a game should allow players to have fun while learning just happens. 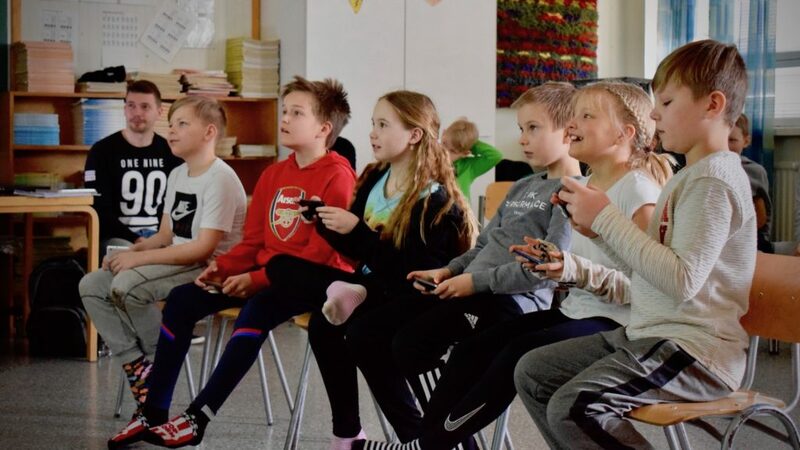 If the game motivates children to learn safety information, I think it has a great potential to be applied on other themes as well, Leinonen says. The first group of pupils is about to play the game. Everyone gets a RescuePosse player character with his or her name, controllable with a mobile phone. The game field is projected on a screen for everyone to see, and this makes it quickly a joint effort for the entire class. The game consists of safety questions that players will answer by moving their characters on the game field. Wrong answer means you’ll be out of the game – quite literally so, since the characters drop into empty space. The young players shout with glee when this happens. ”One more round for this group,” Leinonen announces. Business Tampere and the City of Tampere organised an open call for safety and security related proposals in the beginning of 2019. Leinonen had already tested his game with second graders and decided to apply in order to extend testing. His proposal was chosen, and the testing day with five different classes playing the game was just what he expected. – For game development, it is important to see how pupils play the game. I’ve also gathered data from the test sessions for analysis. It will show for example which questions are especially easy or difficult and how the information is absorbed, Leinonen explains. 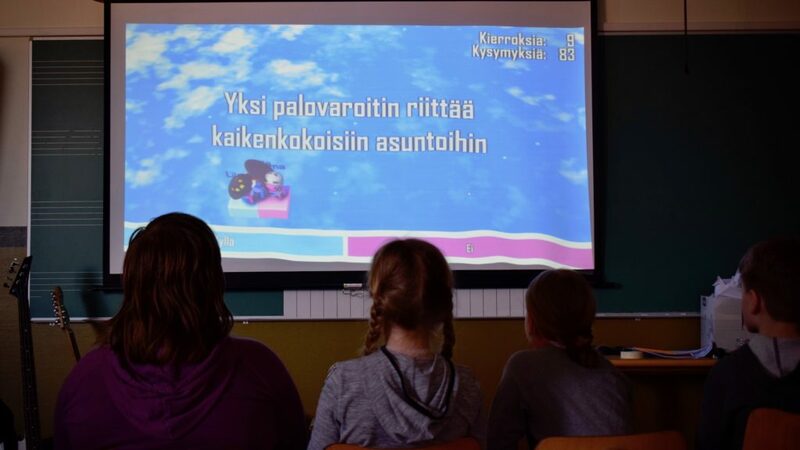 Leinonen also measures the effectiveness of the game with questionnaires: one that the pupils filled before the game session and another they do a week later. An agile experiment won’t allow a long term follow-up, but the point is to see how children acquire new knowledge while playing. As for the development of RescuePosse, the timing of the experiment was very good and allowed the developer to take the time to make a data gathering system. The game will be developed further, and Leinonen is already visioning new uses for the RescuePosse. – There should be a version where one could make questions and answers or use ready-made questions sets, Leinonen says. ”Fun and amusing” recount 3C pupils Iida Harju and Kaapo Volanto. In addition to questions and answers, the game has many little tricks to keep players busy and entertained, and they hit the spot. Did they learn something new? Kaapo says he didn’t, but specifies that he already knew most of the things and the game was still good exercise. Not all the questions were easy. Iida says that for example this one puzzled a bit: what is the most common cause for accidents among young people? Iida and Kaapo are pretty sure they learned the correct answer while playing. The Lucasoft experiment is a part of AIKO Smart safety and security ecosystem agile experimenting. Business Tampere and the Smart Tampere program are boosting smart city development with agile experiments, where companies can test their services or products using the city as a test bed and a living lab. Experiment projects are procured as services from chosen companies and can be used as references once implemented.